We are happy to introduce a new addition to our “Small Packet” shipping options - Packet Standard by DHL eCommerce. It has certain limitations, but can be a good bargain for certain destinations when shipping small inexpensive items. 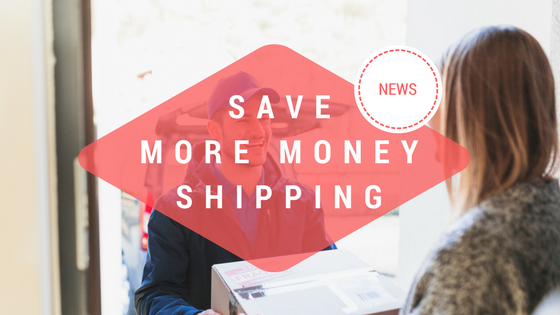 This shipping option is not necessarily the cheapest one for all countries or weights. For example, a 2000g parcel to Spain would benefit from Packet Plus and Ukraine from Airmail Small. However, it is slightly cheaper for Russia, and for Thailand, it is the cheapest option out of all by a whopping 400+ yen. Check out our calculator to learn more. What is a “Small Packet” anyway? Small Packet is the cheapest shipping option for small inexpensive items. The total weight of the parcel must be under 2kg and a total of 3 dimensions under 90 cm. This option is ideal for sending items like medium-size toys, small numbers of comic books, CDs, LP-recordings, badges, T-shirts, etc. 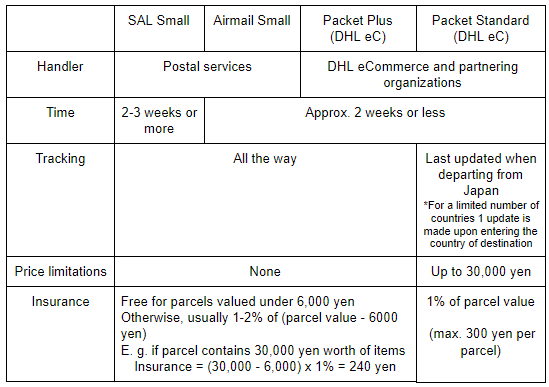 To compare, sending a 1.5kg parcel to the Philippines by Airmail or SAL is 2,400 yen while using Airmail Small will be 1,920 and SAL Small only 1,690 yen. What Small Packet options are available? Currently, we provide four Small Packet options (summary below). SAL Small and Airmail Small are handled by postal services; Packet Plus and Packet Standard by DHL eCommerce. Packet Plus or Standard are handled by DHL eCommerce, whereas the expensive door-to-door delivery option is handled by DHL Express. These two are related but different companies. DHL eCommerce utilizes a network of partners, so your DHL eC Packet will be handed to you by someone from your post office or your local delivery company. I heard that customs are very strict for DHL. Won’t I face unexpected customs duties? Because Packets Plus/Standard are handled by DHL eCommerce, customs procedure they undergo is the same as Airmail or SAL. Too much information! How do I get the best deal? When creating a parcel, choose one of the four options above so that your parcel is packed within the Small Packet size and weight limitations. Please note it is not always possible when the size of your purchase is underestimated. After the parcel is packed, change shipping method in “Parcels” tab and choose the cheapest one.